Tapgol Park in Seoul is formerly called Pagoda Park. It is a smaller park, about 19 thousand square meters in area. It is located in Jongno Street, Seoul, South Korea. I used to visit this park when I did my first level of Korean language studies. Now and then, I still do visit this historical place whenever I am in Jongno area. 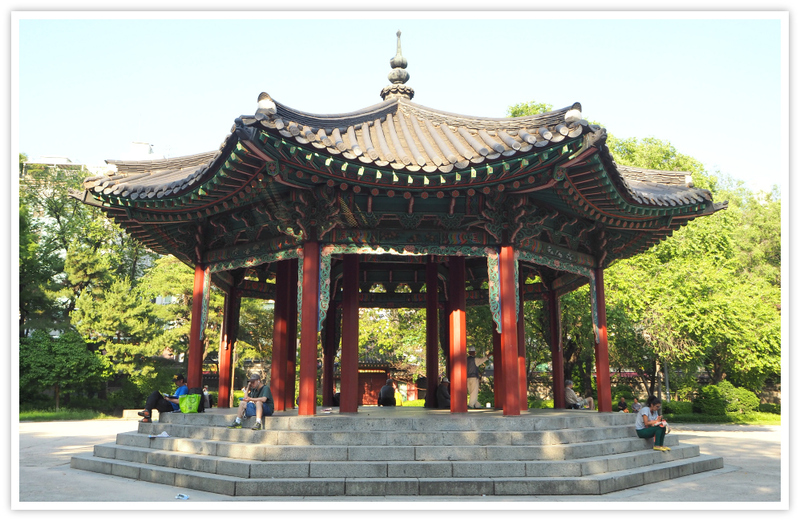 Tapkol Park was the former site of Wongaksa, an important Buddhist Temple in Seoul area. This very site has the famous 13th century 'tap' or pagoda. As you can see in the photo, you will notice that it really looks ancient. 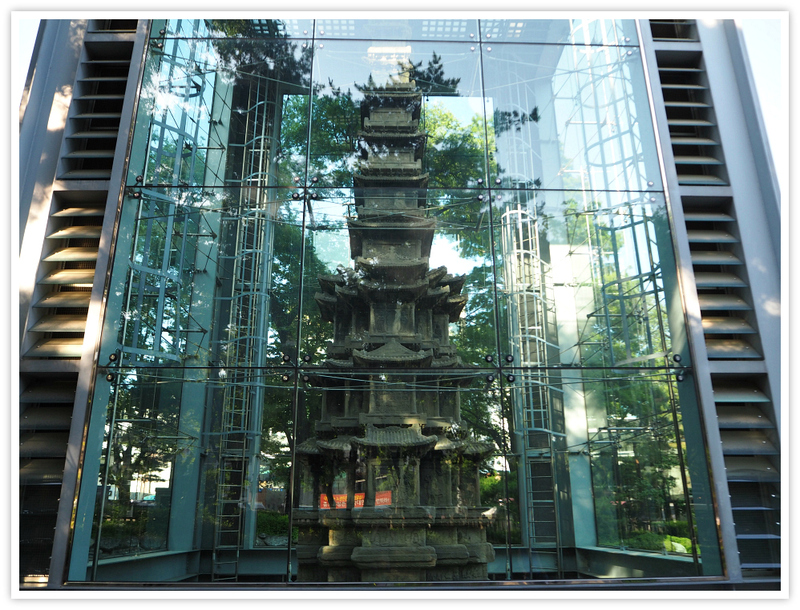 It is a national treasure pagoda with ten stories of stones. As far as I can remember, this Wongaksa Pagoda used to be bare. Meaning, there was no present glass protection. I believe they are not protecting it from thieves but from decay. The city doves, extreme cold and hot weather conditions, and unscrupulous guys could easily contribute to the deterioration of this precious historical treasure. My only complaint is that it is not entirely visible due to the glass’s reflections. Therefore, you cannot appreciate the beauty of this pagoda fully. You cannot get close to it, hence, not seeing or examining it very closely. So, when I took this photo with my smartphone (I don't have a great camera, yet! ), I didn't really feel very pleased knowing that the outcome (photo) would not be refined. Alright, without any further chattering, let us take a look at it, and the other features of Tapgol Park. This pagoda is a 12m high, ten-story stone pagoda remaining at the site of Wongaksa (Temple built by King Sejo. Wongaksa was built in 1465 (11th year of King Sejo’s reign) by expanding the site of Heungboksa (Temple), the head temple of the Jogye Order. This pagoda was completed in 1467 (13th year of King Sejo’s reign), two years following the completion of Wongaksa. King Sejo decided to erect Wongaksa after he experienced the wonder of the sarira incarnation, and it is said that an incarnation of sarira took place and an auspicious sign appeared even during the construction work. Currently, the pagoda is comprised of ten stories. According to historical records, however, a thirteen-story pagoda was originally erected to keep the sarira and the Wongakgyeong (Sutras of Wongak), which had been newly translated at the time. The (…)-shaped podium comprised of three sections: the lower part is inscribed with patterns of dragons and lotus flowers; the middle part depicts a process in which the party of Monk Sanzang, Sun Wukong, Zhu Bajie and Sha Wujing obtain and bring a Buddhist canon from India and the upper part is inscribed with the tales of the former lives and the lifetime of Buddha. The body part of the pagoda inscribed with a scene of the Buddhist mass, includes a tablet, a dragon twined around pillars, a wooden structure and a roof and all of this looks very much like a single building. The pagoda is made of marble which was rarely used at the time. The unique form of this pagoda and the carving skills it displays mean it is regarded as one of the finest examples of stone pagodas from Joseon. This pagoda is in many respects very similar to the Ten-Story Stone Pagoda of Gyeongcheonsa (Temple) (National Treasure No. 86), erected during the Goryeo. The descriptions are printed in Korean, English, and Chinese characters (languages). Located just right in front of the Pagoda is the pavilion. The pavilion of is where visitors can take their rest. But I noticed that most of the visitors here are old male folks. Most of them would stay here all day long to chat, play ‘baduk’ or simply passing time and relaxing. I could guess that being a historic place among older generation. They are mostly part of the independence movement against the Japanese occupation. Around the country, most older people stay in parks during the summer period. 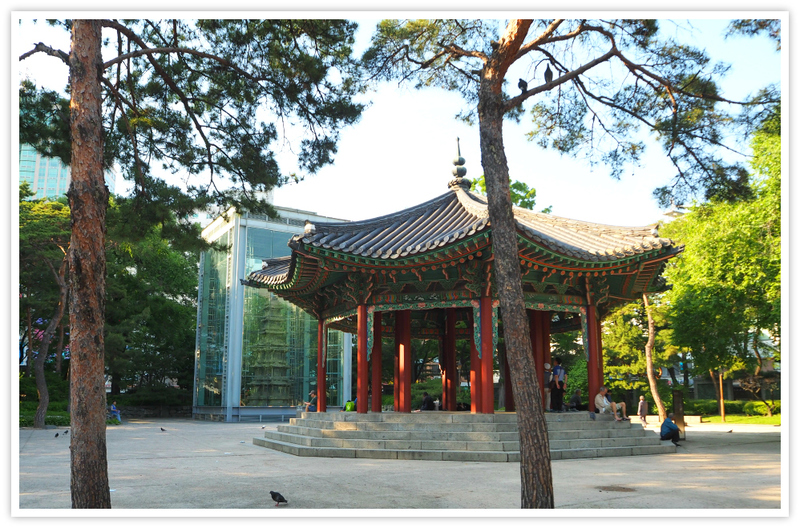 Palgakjeong is an octagonal pavilion in Talgol Park and was built in 1902 (6th year of Gwangmu). 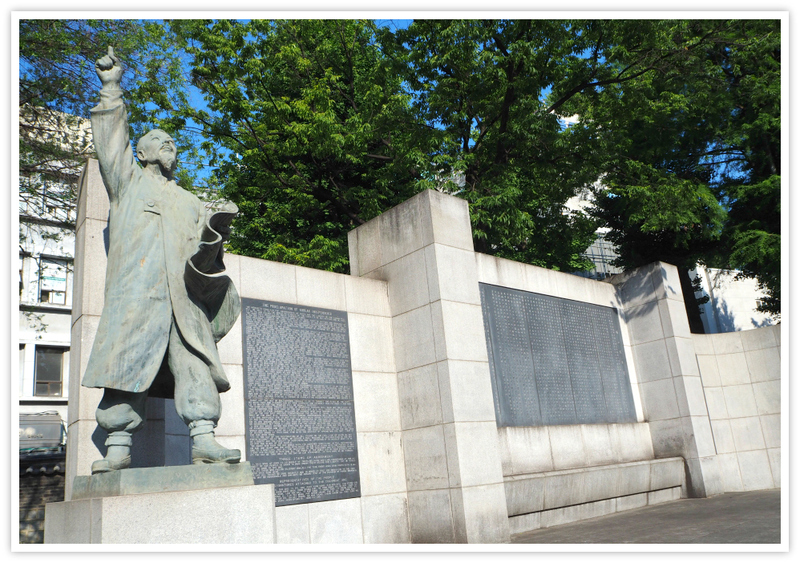 It is a place where people gathered and declared the Korean independence movement, on March 1st, 1919, during the Japanese Colonial Period. 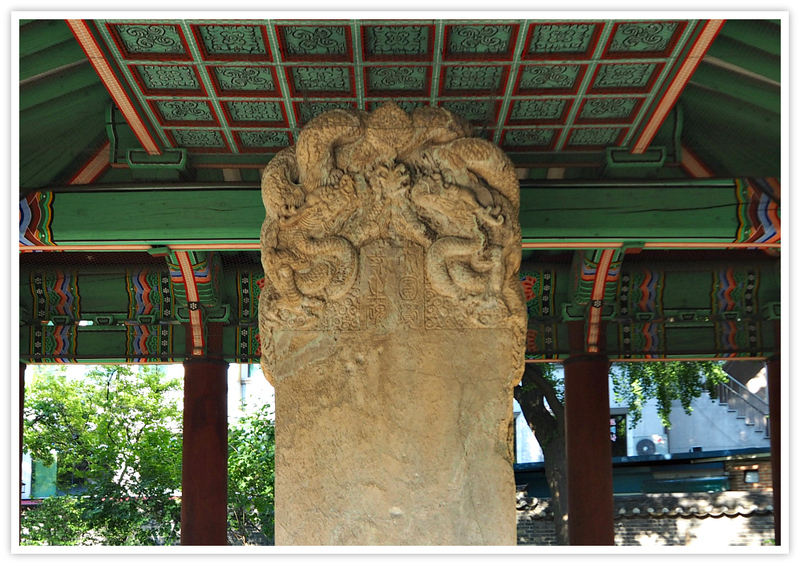 Palgakjeong has columns on the jangdaeseok (large stone stereobat), and the column head has a plain bracket with a tile roof. Construction of Palgakjeong was mainly led by Sim Uiseok (1854-1924), who was famous for harmonizing both traditional construction skills and modern ones. Tapgol Park was the first modern park built in Seoul. It is uncertain when it was first made, but it is commonly believed to have been built in the 1890s. Mr. John Mcleavy Brown, who used to serve as an Inspector General of Customs for the Emperor Gojong administration, first suggested its construction. It was also called Tapdong Park and Pagoda Park; however, it has been called by its official name, ‘Tapgol Park,’ since 1991. Therefore, this park was given this present name just two years after I first set foot in this country – interesting to know! The descriptions above are also printed in Korean, English, and Chinese languages. The Wongaksa (Temple) tortoise monument is housed in a traditional Korean building. You can see the tortoise stele that was built in the 15th century. This was to commemorate the founding of Wongaksa Temple in 1465. As I mentioned above, Tapkol Park was the former site of Wongaksa (Wongak Temple). On the front of that granite slab are inscriptions and calligraphy describing this special place. The tortoise at the base is made of marble stone. In case you do not know already, turtles (or tortoise) in Korean tradition are symbols of long life and strength. This monument is about 1 meter by 4 feet wide and stands 16 feet tall. Other special symbolic features of this monument are the elaborately carved dragons holding a Buddhist gem located on top of it. Monument of Wongaksa (Temple) was erected in 1471 (2nd year of King Seongjong’s reign) to record the particulars of the foundation of Wongaksa on this monument. King Sejo, who was a devout believer of Buddhism, built Wongaksa at the site of Heungboksa (Temple) in 1465 (11th year of King Sejo’s reign), after being amazed by the incarnated sarira at Hoeamsa in Yangju. When a thirteen-story stone pagoda was completed in 1467 (13th year of King Sejo’s reign), King Sejo held a dedication ceremony together with Yeongduenghoe (Lantern Festival) and directed subjects to erect a stone monument recording the circumstances. A turtle shape stone prop was made, and lotus leaves were carved on the back of the turtle to create a space for the body stone of the monument. The body stone and the headstone ‘isu’ were made with a single stone. The height of the monument is 494 cm. The turtle was made of granite, and the body stone and headstone were made of marble. Master writers and calligraphers at the time were in charge of the inscription. Kim Suon composed the inscription on the front and Seoung Im wrote it in a calligraphic style. Seo Geojeong composed the inscription on the back and Jeong Nanjong wrote it in a calligraphic style. Wongaksa became an empty temple as private houses near the royal palace were pulled down during the period of King Yeongsangun. In modern times, the area was turned into a park. Only a Ten-story Stone Pagoda (National Treasure No.2) and this monument remain today, showing traces of Wongaksa. Just right beside this structure, you can find a newly unearthed treasure - a well. 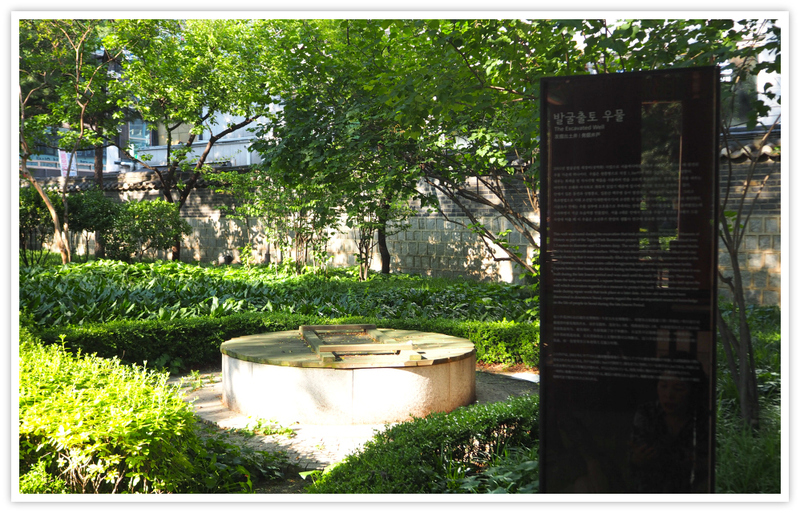 This well was found during the excavation that took place in 2001 by the Seoul Museum of History as part of the Tapgol Park Renovation project. The well features a cylindrical form 1.3 meters in diameter and 5.2 meters deep. The well is lined with rectangular stone blocks laid to form a smooth inner surface. When it was discovered, the well was filled with clay sands showing that it was intionally filled up to be abandoned. Excavators found at the well Japanese coins, Joseon coins called sangpyeong tongbo and a Japanese beer bottle. Experts believe that based on the block laying techniques and the usage of bricks that it was built during the late Joseon period and was used until the early 20th century. There was, when the well was excavated, a square frame of long rectangular stone blocks laid upon the well which excavators regarded as a measure to protect the well. The current structure was made during repair work that took place at a later date. 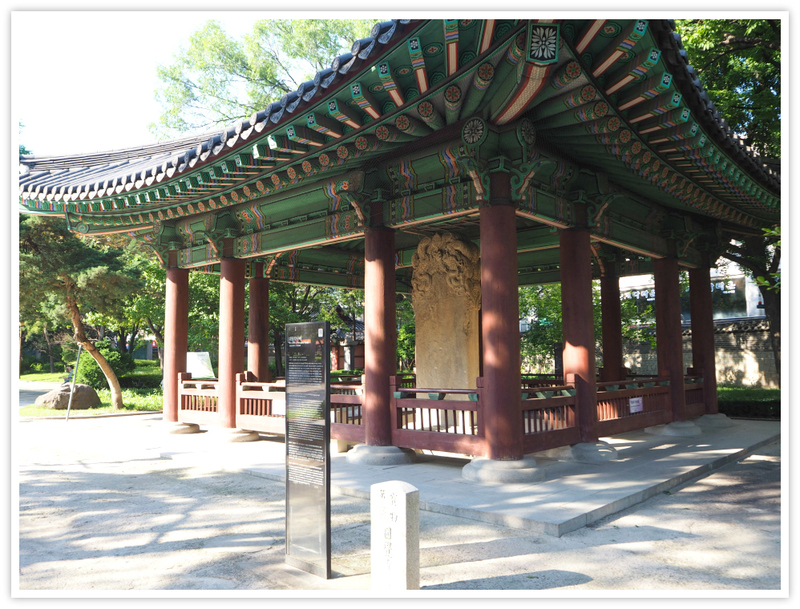 As few old wells have been discovered in downtown … the well an important source of knowledge on the life of people in Seoul during the late Joseon Period. Those descriptions were printed in Korean, English, and Chinese characters (languages). It does not look much but we can only imagine how important wells were in that period when they do not have our present efficient water system. Among other historical treasures you can find in the park, you can see some old relics gathered from other places in Korea. These relics must be precious especially among anthropologists and scholars studying the past through these items. 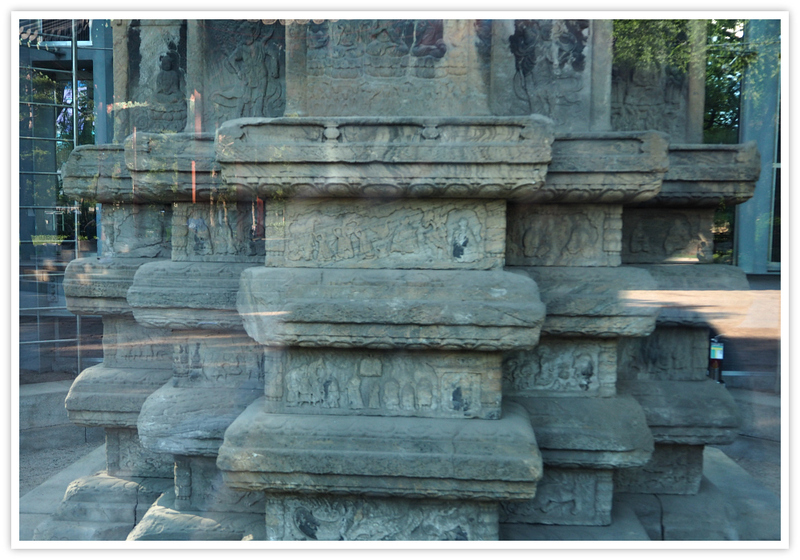 According to the descriptions posted beside these stone relics, three of them are marble statues presumed to be Divine Guardians or Bodhisattvas that were erected to protect the stone pagoda of Wongaksa Temple. The stone is a pillar stone with the inscription 'Bokcheonggyo.' It is the former name of Hyejeonggo Bridge which used to connect the north of Gwanghawmun Post Office to Junghakcheon Stream long ago. In that bridge, it was known that many corrupt officials were executed during the Joseon Period. However, most of the stone relics are unknown, and certainly they provide valuable historical information for research on traditional stone sculpture. Historically, Tapgol Park symbolizes a very relevant event in Korean history. It is where the first site where the Proclamation of Independence was read in 1919. 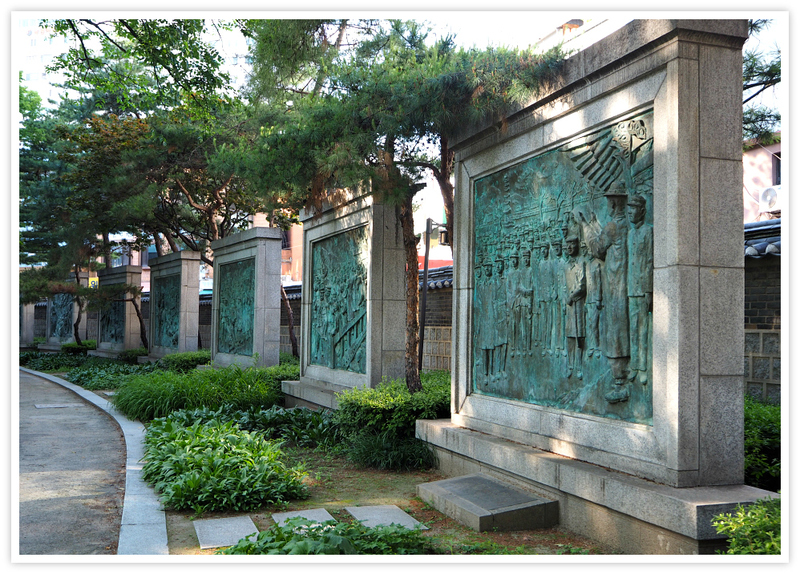 The bas-relief statues, below, represent the Korean independence activists who were themselves part of the movement. Poems and the Proclamation of Independence Movement are inscribed on the wall, as in the photo below. Tapgol Park, being located at the center of Seoul, was also the popular place for various protests and demonstration activities. It is where the democracy movement on June 24, 1986, that forced the former president Chun Doo-whan accepted to hold a free election. “We make this proclamation having back of us 5,000 years of history, and 20,000,000 of a united loyal people. We take this step to ensure to our children for all time to come, personal liberty in accord with the awakening consciousness of this new era. This is the clear leading of God, the moving principle of the present age. The whole human race’s just claim. It is something that cannot be stamped out or stifled, or added, or suppressed by any means." Yes, the proclamation is much longer and filled with great expressions of freedom and autonomy as visions for a free nation and people. That explains why so many older people spend their time here. Indeed, this is a very historic site for both religious as well as the struggle for independence and freedom among the Korean people. who can visit tapgol park? I believe that any person of any age – children and old – can go in. This is very much accessible as it is in central Seoul area. A parking area can be hard to find, except for the paid ones. Also, it is where other popular tourist sites and attractions are located – Jongmyo Shrine and Insadong, among others. There are few benches, but many would prefer to sit down on the steps of the pavilion. Washrooms are available as well inside the park. Group tours are also welcome. Subways: Lines 1, 3 and 5 in Seoul. Buses: Buses pass through Jongro’s main road, so you can just search any bus from your place. Have an awesome visit, and thanks for reading this page.